We thank Murtaza Zulfee, Vice President ICF and member ICF-Media Commission for the following reports. As promised I herewith send extracts of details that appeared in the Sunday Observer of March 9th 2008 of Sri Lanka. The world carrom championships was held in Mize France recently. The Sri Lankan team which was represented by Chamil Cooray and Germain Gunawardane of Seyzlan Bank and Nishantha Fernando of F & G Group of Ceylinco Consolidated who won the World Title for carrom brought fame honour and pride not only to Ceylinco Consolidated but also to Sri Lanka. Deshamanya Dr. Lalith Kotelawela, Lady Dr. Sicille Kotelawela and all of us of Ceylinco Consolidated share the pride and joy of this great victory. Chairman Deshamanya Dr. Lalith Kotelawela has presented a house and a car to each of the three World Champions Chamil Cooray, Germain Gunawardene and Nishantha Fernando. They were also promoted. The Carrom Federation of Sri Lanka reaches a half century this zear and the best reward that the Sri Lankan carrom players gave was this great achievement being World Champions. We congratulate them. Chairman Dr. Lalith Kotelawela did not hesitate to reward all three of them with a house, a brand new car and promotions to each of them. Let me express my heartfelt thanks to Deshamanya Dr. Lalith Kotalawela and Lady Dr. Sicille Kotalawela, Deputy Chairperson Ceylinco Consolidated for the support and guidance given to the players. The Board of Directors and staff of Seylan Bank and F & G Group are appreciated for the encouragement given to carrom at all times. In the history of the game of Carrom after 19 years first time Sri lanka beat Indiain Men’s team event of World Carrom Championship 2008, Sri lankan player Chamil Cooray and Nishanta Fernando beat Yogesh Pardesi and R.M Shankara(India) while M.Natraj (India) beat Germain Gonewardena (Sri), but in the best of three games, Sri lanka won the title by 2-1 games while United Kingdom secured the 3rd position. In the Men’s single event 1st and 2nd & 3rd positions were secured by Yogesh Pardesi, M.Natraj and R. M. Shankara of India. In the 5th World Carom Championship Women’s Team event Indian Women’s team beat Srilankan Women’s Team and French Women Team secured the 3rd position respectively. Women’s Double event Final was played between two Indian Teams in which Rashmi Kumari & P. Nirmala beat Illavazhaki & G. R. Ravathy by 3-2 game while Srilanka’s A. Vikramasinghe & Yashika Rahuvaddha stood 3rd. In the Women’s Single event.1st, 2nd and 3rd position holder were Indian ILU.Reshmi and P.Nirmala. During this championship PakistanCarom Players Mohammad Aamir Khan, Nadir Hussain, Murtaza Khan Zulfee and Ramzan Ali won the matches against Japan, South Korea, German, UK, USA and Italy’s carrom players and they have proved that Pakistan Carom Team is eligible to participate in the World Carrom Cup 2010 which will held in Dallas USA. In the end, the Cannes’ Mayer, the President of International Carom Federation Mr.Arif Naqvi and Secretary General of ICF Mr. S.K Sharma addressed the guests of the closing ceremony and distributed awards among the winning players. On this occasion French Carrom Federation’s President Mr. Frank, General Secretary Mr. Aur�lien Hanique, Mr. Karim Nessakh, Mr. Denis Brown, Miss Emilie Neuhauser, Katia Merkoulova and others were present. New Delhi : February 20, 2008 – Shri J.P. Agarwal, MP, President, Delhi Congress Committee and Chairman Al India Carrom Federation welcome & extended Lunch to the Indian Carrom Team today at Parliament in the presence of Shri Jabir Hussain M.P. Rajya Sabha from Bihar as Special Guest. Indian Player Yogesh Pardeshi who became National Champion in recently held Senior National Championship at held at Championship annexed the crown of World Champion in the 5th World Carrom Championship scheduled to be held Palace de Festivals, Cannes, France defeated team mate M. Nataraj in a straight set of games at 25-22 and 25-12. In the 2nd game, Yogesh Pardesi a white slam i.e. break to finish. Earlier, Yogesh Pardeshi was World No. 2. Playing for 3rd place defending Champion R. M. Shankara (India) defeated his teammate R. Arokiaraj at 8- 25, 25-11, 25-6. 5th to 8th place secured by D. Nishant Fernando (Sri Lanka), Sumahar Ali (UK), Shake Challa (USA) and Nazrul Islam (UK) respectively. Indian reigning National Women Champion, I. Illavazhaki also captured the Women World Champion title defeating her teammate P. Nirmala at 25-11, 25-11, whereas ex-World Champion Rashmi Kumari has to satisfy with 3rd place when she defeated her teammate & Ex-world Champion G. Revathi at 25-17, 25-1in play off match. 5th to 8th position were secured by Amitha Wickramasinghe. 5th to 8th position were secured by Amitha Wickramasinghe (Sri Lanka) Yashika Rahubuddhe (Sri Lanka), Udeshika Kumari (Sri Lanka) and Elisa Martinelli (Italy) respectively. Indian Pair bagged the Men’s Doubles Trophy when R.M. Shankara & M. Nataraj defeated Sri Lanka Pair Chamil Cooray & Nishant Fernando at 20-25, 23-18, 25-14. Hennce India lost the Silver Medal in Men Doubles and secured Bronze when Yogesh Pardeshi & R. Arokiaraj defeated another Sri Lanka pair G. Goonewardena & Viraj Fernando at 20-15, 25-13. In Women Doubles Indian players won Gold & Silver Medal when Rashmi Kumari & P. Nirmala clinched the Women Doubles trophy defeating another Indian Pair Illavazhaki & G. Revathy. Whereas Sri Lanka Pairs Udeshika Kumari & A. D’souza and A. Wickramasinghe & Yasika Rahubauddhe were at 3rd and 4th plce respectively. Major set back to India was the first time in Carrom history India lost Men Team Championship title against Sri Lanka. Followed by U.K. and Germany at 3rd & 4th places. In Women Team Championship India retained the title defeating Sri Lanka in final. Whereas, France and Japan secured 3rd & 4th position respectively. In the swiss league, Indian player M. Nataraj defeated his team mate Yogesh Pardesi in Final . D. Kubendra Babu was at third place when he defeated Nishant Fernado of Sri Lanka in playoff match. Indian players R. Arokiaraj, R.M. Shankara, Sandeep Deorukhkar, Pakasjh Gaekwad and Jitendra Kale secured 5,6,15,16.and 26 poswition respectively. Whereas Women Players P. Nirmala wo was at 7 was top in Womens follwed by I. Illavazhaki at 11, Rashmi Kumari at 13, Kavita Somanchi at 19, Sangeeta Chandorkar at 20, G. Revathy at 21, Anuraju at 3-, and Anupama kedar at 37. All IndianWomen players i.e. 8 in numbers amongst the 1 to 11 of Women section. Shri S. K. Sharma informed that it is alarming for India to prepare in better way for the next International. 24 Slams (19 whites & 5 black) in which European players from U. K. France and Japan had also secured white slam i.e. break to finish. This Championship was conducted under the Games Festivals by French Carrom Federation held at Cannes, France in which lakhs of people from all over the world visited and more over International Carrom Federation is in its 20th years..
R.M. Shankara – Current World Champion and Two times World Champion and Ex- National Champion working in Indian Airlines at Bangalore participating as a Player in Men Team. If he wins he will set a new record of Winning World Championship third time. R. Arokia Raj – World No. 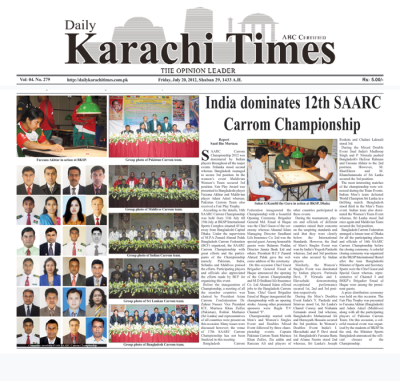 2 in the 1st World Carrom Championship participating as a player in Men Team. He is employed in Central Bank of India at Chennai and player of Bank Sports Board. M. Nataraj – Winner of 1st World Cup participating as player in Men Team. He is employed in India Airlines at Coimbatore. Yogesh Pardesi – Current National Champion, Ex-Saarc Champion and Ex-World No. 2 participating as a player in Men Team. He is employed in Indian Oil Corporation, Pune and player of Petroleum Sports Promotion Board. D. Kubendra Babu – Ex- SAARC Champion & Winner of 2nd French Open Carrom Championship, will play in Swiss league of the Championship. D. Kubendra Babu who is son of great Carrom Player S. Dilli is working in Customs Department, Chennai. Jitendra Kale – Jitendra Kale, working in Indian Audit & Accounts Department, Mumbai will play in Swiss League of the Championship. Prakash Gaikwad : Prakash Gaikwad, working in Life Insurance Corporation of India will play in Swiss League pf the Championship. Rashmi Kumari - Ex-World Champion and Winner of 1st World Cup & Ex-National Champion will participate as a player in Women Team. Rashmi is employed in Bharat Sanchar Nigam Ltd. at Patna (Bihar). I. Illavazhaki – Winner of 2nd World Cup, Two times SAARC Champion and National Champion in currently concluded Senior National Championship will participate as a player in Women Team. She hails from a poor family at Chennai and youngest participants. P. Nirmala – Ex-SAARC Champion, Ex- World No. 2 and 6 times National Champion will participate as a player in Women Team. She is employed in LIC of India at Mumbai. G. Revathi – Ex-World Champion & Ex-National Champion will participate as a player in Women Team. She is employed in Indian Bank, Chennai. Kavita Somanchi – Ex-Delhi Champion and employed in Reserve Bank of India at Bangslore Kavita Somanchi. Who is daughter of a Great Carrom player of India as well as Delhi will participate in Swiss League of the Championship. Anuraju – Ex- World Champion and Ex- National Champion employed in the Office of Comptroller General of Defence Accounts at Chennai will participate in Swiss league of the Championship. Sangeeta Chandorkar – Ex World No. 2 & Ex-National Champion and an employee of Reserve Bank of India, Mumbai will participate in Swiss league of the Championship. Anupama Kedar – Ex-National Champion and Winner of 1st US Open Carrom Championship and honoured with Chatrapati Shivaji Award Anupama Kedar will participate in Swiss league of the Championship. Smt. Kamna Yadav = General Secretary Fridabad District Carrom Association accompanying was Manager of Indian Women Team. Shri Bharat Bhushan - General Secretary, Bihar State Carrom Association and Vice President of All India Carrom Federation was Coach. Shri P. Raveendran – Asstt. General Secretary, All India Carrom Federation, General Secretary, Kerala State Carrom Association and Chairman Umpires Commission of ICF was Technical Director. Shri T. Dhiren Singh – General Secretary, All Manipur Carrom Association and International Umpire was Umpire. 8th Place Nazrul Islam (UK) Elisa Martinelli (Italy). 44. Sunahar Ali, Mohammed U.K.
A warm reception was extended at IGI Airport, New Delhi in the leadership of Shri M. Sharan, Asstt. Secretary and members of one NGO Dalit Group. The Team was given reception by Shri J.P. Agarwal, M.P., President, DPCC and Chairman, All India Carrom Federation in the parliament. Team was introduced by Mr. P. Raveendran, Asstt. General Secretary, All India Carrom Federation to Shri J. P. Agarwal. Then a lunch was hosted by Shri J. P. Agarwal. After that on the request of Shri Jai Prakash Agarwal and thereafter follow up made by Shri Prabhjit Singh Bachher, General Secretary of Vidarbha Carrom Association through Shri Hanumant Rao Deshpande and Shri Ravindar Singh Jadhav, IAS, Personal Secretary to Hon’ble President of India, H.E. Pratibha Devisingh Patil, Hon’ble President of India had a meeting with Indian Team on 21st Febrauary, 2008 and blessed the Indian Carrom Team on their victory. At that occasion, Shri Sarabjit Singh, President of All India Carrom Federation and World Carrom Champion (Women) I. Illavazhaki extended reception to Hon’ble President of India as she entered in the hall with bouquet. Shri J.P. Agarwal, had also shown his presence and presented a set of Carrom to Hon’ble President. Shri S. K. Sharma, General Secretary, introduiced the Indian Carrom Team to Hon’ble President of India and detailed in brief about carom and some difficulties in the promotion. The function ended with a Photo session with Hon’ble President of India.